This is the one that starts out like a greek tragedy – a sad tale, like the one that young Mamillius tells his mother on a cold and probably dreary winter’s evening in Sicilia, where his father rules. A sad tale – when sad still also had the double meaning of serious. And a simple one, or so it seems: Because Leontes, King of Sicilia, is jealous of his chaste wife, pregnant with his child, because she is a friendly host to Bohemian’s King Polixenes, who just spent nine months as a guest at the palace (and has clearly outlived his welcome). The setup of both stage and costumes brings you right into the middle of the story: the clothes Leontes and his courtiers wear are black and grey, the cloaks used seem to transform the actors into pieces of a chess game – a game that will see the king in check mate rather sooner than later. Because as inevitable as in a greek tragedy the king cannot or will not shake his unfounded jealousy and therefore not only drives his brotherly friend Polixenes from his shores but also officially accuses his wife of adultery. And not even the great oracle of Apollo which clears the queen of all accusations can set the king right. In a fit of rage he prepares to put Queen Hermione on trial for her life. It doesn’t come to that though. His first born son, heir to the throne Mamillius, does not survive the anxiety of knowing that his mother is in prison – where she already prematurely gave birth to a daughter. And when the queen hears of this, she collapses and dies too. The newborn girl named Perdita (the lost one) is abandoned on the shores of Bohemia, the ship that carried her, falls prey to the wrath of the gods – nobody survives. And again brilliant Marti Maraden picks costumes and stage props to show how happy everybody could be if only there was trust and love. Flowers bloom, the clothes are colorful and almost remind us of a pastoral idyllic we can only dream of. It comes as no surprise that in such a loving environment Perdita and the young prince fall for each other – only that she is a simple shepherd’s daughter. For all those strings to untangle it takes the brilliance of Shakespeare and of course the brilliance of the actors involved to make the story clear and understandable. Fantastic as always Ben Carlson, whose precise speech and impassioned way of delivery are always a joy to watch. He is joined by Yanna McIntosh as his faithful queen, who is just wonderful as ever. Then Seana McKenna, who plays Paulina, the woman who forces the king to remember day after day of what he did to his wife and children. She is fierce and marvellous in her righteous anger and her fear, too. I am always intimidated whenever I see her out of costume in the streets of lovely Stratford. One of these days I will find the guts to just tell her how much I admire her work. And last, but not least, there is Tom Rooney as the charming, but very crooked little thief Autolycus. The way he plays the audience and begs for coins and stays in character is just brilliantly amazing. He fills the small part (the comic relief in this “sad tale”) with so much life and fire, it’s just fantastic. And what’s even more amazing: Carlson and Rooney were absolutely adorable at the stage door, friendly, always good for a couple of words and a modest thank you. 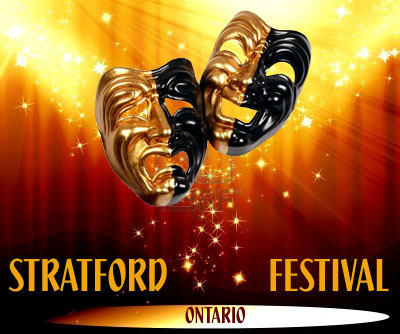 This entry was posted in Stratford Festival Ontario and tagged ben carlson, marti maraden, Ontario, Stratford Festival, tom rooney, winter's tale. Bookmark the permalink.